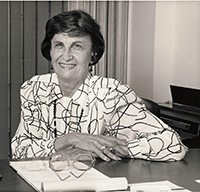 Pearl Goldberg joined Florida Lions Eye Bank in 1965, the first Executive Director of the first eye bank in Florida. Over the course of her twenty year career, Pearl’s hard work and dedication made Florida Lions Eye Bank one of the biggest providers of human corneal tissue in the United States. In addition to supporting the daily operations of Florida Lions Eye Bank, Pearl assured its future by forging long-lasting relationships within the community, and establishing an endowment fund to provide continuous financial support for the eye bank. Pearl passed away in December 2006. To commemorate her inspiring life and her contributions to eye banking and ophthalmology, Florida Lions Eye Bank established a research fund in her name. The Pearl Goldberg Research Fund is used to award an annual Pearl Goldberg Fellowship Grant to a pre-residency Fellow. The Fellow works alongside Dr. Sander Dubovy in the Bascom Palmer Eye Institute ocular pathology laboratory and dedicates the majority of his/her time to supporting scientific research related to ophthalmology, eye banking, and corneal transplantation. The Pearl Goldberg Research Fellowship project was transferred to the Beauty of Sight Foundation upon its creation. For more information about the Pearl Goldberg Research Fellowship or to learn how to apply, please contact the Bascom Palmer Eye Institute Pathology Laboratory at (305) 326-6357.